ePub file 16.2 MB Best for mobile devices. mobi file 33.5 MB Best for Kindle 1-3. What are the primary international and domestic factors shaping Chinese nuclear forces and policy, and how are those variables likely to evolve over the next 15 years? How do Chinese strategists perceive the strategic environment, and how might nuclear developments in the United States affect Chinese nuclear decisionmaking? How might multilateral dynamics between the nuclear states of Asia shape Chinese calculations? How will bureaucratic processes and politics affect decisions about the future direction of Chinese nuclear forces and policy? How will Chinese nuclear forces evolve through the 2020s, and to what extent (if at all) will Chinese nuclear policy change? China's approach to nuclear deterrence has been broadly consistent since its first nuclear test in 1964. Key elements are its no-first-use policy and reliance on a small force of nuclear weapons capable of executing retaliatory strikes if China is attacked. China has recently accelerated nuclear force building and modernization, and both international and domestic factors are likely to drive faster modernization in the future. Chinese nuclear planners are concerned by strategic developments in the United States, especially the deployment of missile defenses. Within the region, Beijing is also an actor in complex multilateral security dynamics that now include several nuclear states, and the improving nuclear capabilities of China's neighbors, especially India, are a growing concern for Beijing. Constituencies for nuclear weapons have gained in bureaucratic standing within the People's Liberation Army (PLA). With few, if any, firewalls between China's conventional and nuclear missile forces, new technologies developed for the former are already being applied to the latter, a trend that will almost certainly continue. Given these changes, China is likely to increase emphasis on nuclear deterrence, accelerate nuclear force modernization, and make adjustments (although not wholesale changes) to policy. China has, however, recently accelerated nuclear force building and modernization. Strategists are especially concerned about the development of U.S. missile defenses and conventional prompt global strike capabilities. But planners are also concerned about the growth of nuclear inventories in Asia and the complex nuclear dynamics emerging there. Some strategists say privately that China might not accept a push from India for nuclear parity, should New Delhi embark on such a course. Civilian leaders are reportedly less involved than they once were in the details of decisionmaking about nuclear research, development, and production. The nuclear constituency within the PLA is also gaining increased status and voice. 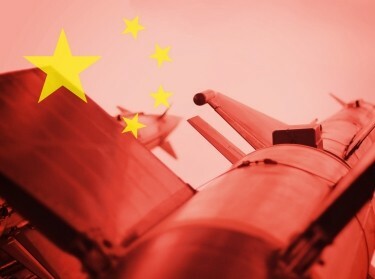 There is no firewall between China's conventional and nuclear missile forces, and technologies and practices developed for the former are already being applied to the nuclear forces. In the future, this may give China some limited counterforce capability. Although unlikely to change formal policy formulations, China may adjust its definitions of key terms or add caveats. It may, for example, hedge its language on no-first-use to include a conventional attack on its nuclear forces as "first use," thus permitting a nuclear response. The United States and China should deepen their dialogue on strategic issues to better understand where restraint might have the greatest positive impact. The United States should limit national missile defense to a scale commensurate with the its stated purpose, defense against attack by rogue regimes. Missile defenses are one of the primary drivers of Chinese nuclear force building. China, for its part, should work toward visibly separating its conventional and nuclear missile force elements to reduce the possibility of confusion in the event of a conflict. China should also minimize the MIRVing of missiles, especially missiles that might be vulnerable to preemptive attack. Decades of arms control experience suggest that MIRVs can, under some circumstances, diminish crisis stability by increasing the incentives for both sides to strike first. U.S. leaders should take steps to fortify the credibility of extended deterrence. As Chinese capabilities improve, some regional states, especially Japan and South Korea, may request more than purely rhetorical reassurance. They may also seek the redeployment of U.S. nuclear weapons in Asia, and Washington will want to consider how far in this direction it is willing to go. Eric Heginbotham, Jacob Heim, et al. The research reported here was prepared for the United States Air Force and conducted within the Strategy and Doctrine Program of RAND Project AIR FORCE. Heginbotham, Eric, Michael S. Chase, Jacob Heim, Bonny Lin, Mark R. Cozad, Lyle J. Morris, Christopher P. Twomey, Forrest E. Morgan, Michael Nixon, Cristina L. Garafola, and Samuel K. Berkowitz, China's Evolving Nuclear Deterrent: Major Drivers and Issues for the United States. Santa Monica, CA: RAND Corporation, 2017. https://www.rand.org/pubs/research_reports/RR1628.html. Also available in print form.